I am not sure about you, but the LAST thing I feel like doing when I arrive home after a long day (especially when it’s dark outside) is preparing a large elaborate meal. This is a dangerous time in your day because it would be very easy to order something unhealthy, sit on the couch, and dive into your current Netflix obsession. HOWEVER, this Sheet Pan Balsamic Basil Chicken Rice Bowlcan help keep your night lean, while getting you into your Netflix show just as quickly! I’m a big fan of sheet pan dinners! Throwing together chicken, veggies and other lean-gredients for lunch or dinner couldn’t be easier (or healthier). If you’re in a pinch and want to get a delicious lean-meal on the table quickly, this is the perfect dish -- Super lean-mazing, simple ingredients and cooks in 30 minutes? What’s not to like? Thank you! Enjoy the Leanness! I made it with broccoli and cauliflower rice, but the options for veggie substitutes are endless! Get creative! Cauliflower rice has become our go to staple, as it goes with pretty much goes with everything. Not only is it low in calories (perfect for a lean meal), it’s full of vitamins, minerals and fiber. The chicken and veggies are drizzled with balsamic vinegar and topped with garlic and basil, which gives the dish tons of flavours. Combined with the meat juices… need I say more? Finally, arguably the BEST part about this dish is that it’s a great Lean Prep option! Throw more of those simple ingredients on the baking sheet and watch the rest of your week get extra lean! Make a big batch for the week with VERY little fuss, not to mention VERY little clean up. So good and easy to make that you’ll forget I am wearing socks and slides! Dice chicken into cubes and spread them in a single layer on one side of your baking sheet. Add broccoli florets to the baking sheet in a single layer beside your chicken. Slice red onion into strips and spread in a single layer on the baking sheet beside the broccoli. Then add cauliflower rice to the baking sheet beside the onion. Drizzle ¼ cup balsamic vinegar over the chicken and broccoli. Then add minced garlic to your chicken. Add salt and pepper to everything on the baking sheet and bake in the oven for 15 minutes. Remove from the oven and drizzle 2 additional tablespoons of balsamic vinegar and chopped basil to your chicken. Place back in the oven and bake for an additional 5 minutes. 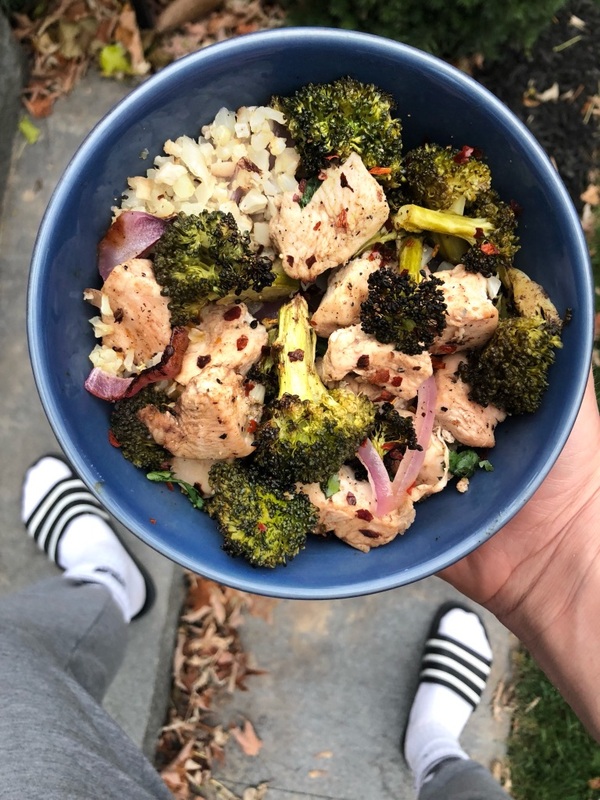 Layer your cauliflower rice, red onions, broccoli, and chicken in bowls. Drizzle more balsamic vinegar over top if you prefer a stronger taste and enjoy!